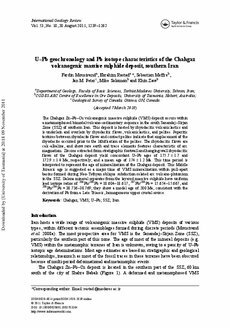 The Chahgaz Zn–Pb–Cu volcanogenic massive sulphide (VMS) deposit occurs within a metamorphosed bimodal volcano–sedimentary sequence in the south Sanandaj–Sirjan Zone (SSZ) of southern Iran. This deposit is hosted by rhyodacitic volcaniclastics and is underlain and overlain by rhyodacitic flows, volcaniclastics, and pelites. Peperitic textures between rhyodacite flows and contact pelites indicate that emplacement of the rhyodacite occurred prior to the lithification of the pelites. The rhyodacitic flows are calc-alkaline, and show rare earth and trace elements features characteristic of arc magmatism. Zircons extracted from stratigraphic footwall and hanging-wall rhyodacitic flows of the Chahgaz deposit yield concordant U–Pb ages of 175.7 ± 1.7 and 172.9 ± 1.4 Ma, respectively, and a mean age of 174 ± 1.2 Ma. This time period is interpreted to represent the age of mineralization of the Chahgaz deposit. This Middle Jurassic age is suggested as a major time of VMS mineralization within pull-apart basins formed during Neo-Tethyan oblique subduction-related arc volcano-plutonism in the SSZ. Galena mineral separates from the layered massive sulphide have uniform lead isotope ratios of 206Pb/204Pb = 18.604–18.617, 207Pb/204Pb = 15.654–15.667, and 208Pb/204Pb = 38.736–38.769; they show a model age of 200 Ma, consistent with the derivation of Pb from a Late Triassic, homogeneous upper crustal source.